As a teacher, you may have already seen the benefits of incorporating nature-based activities in your classroom. Perhaps you’ve seen your students work better together when they spend time outdoors, or you’ve seen the enthusiasm they have for hands-on projects about the environment. In fact, research has shown that environmental education can help students build critical thinking skills, increase focus, manage symptoms of ADD, and improve test scores. If you’re looking for more ways to incorporate environmental education into your classroom, Project Learning Tree’s new online workshops may be a great solution. Over the last 40 years, we’ve trained 675,000 educators to help students learn how to think about complex environmental issues. 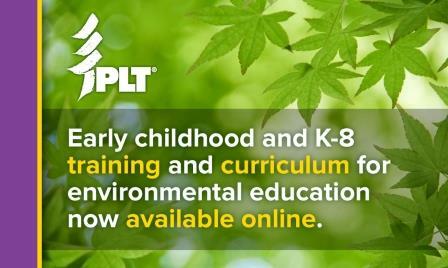 Now, online trainings are available for early childhood, K-8, and how to become a GreenSchool. Take advantage of these award-winning educational materials to help you foster wonder and curiosity about the natural world as you take students outdoors and bring nature into the classroom. Early childhood and K-8 online trainings include video demonstrations, lesson planning activities, access to over 90 activities, links to state-specific resources, and a certificate of completion. The hands-on activities are multi-disciplinary and teach to core subjects, especially STEM, reading, writing, and social studies. They are also correlated to state and national academic standards including Common Core and the Next Generation Science Standards’ three-dimensional approach. Some states have even supplemented the online course with state-specific materials and offer continuing education credits. Project Learning Tree’s GreenSchools program inspires students to improve the environment at school, at home, and in their community. Through the GreenSchools program you’ll receive the tools, training, and resources for student-led Green Teams to reduce their environmental impact and create healthier schools. If you’re interested in becoming a GreenSchool, you’ll learn the ins and outs of the program, how to guide your students in designing and leading an action project, and how to get the support of administrators, staff, parents, and community members. Whether you live in an area where in-person workshops are not easily accessible or you want to do professional development when and where it’s convenient for you, there are many reasons to try an online training! Check out Project Learning Tree’s online training courses.